A few days ago I cleaned out and rearranged our whole school space so that I could use our rainbow drawers for Adam. You can see how I set everything up here. Since then, it has been sunny and I have barely been able to get the boys to come inside. Although today was the first day we had worked through the drawers, we have been getting in a good habit of checking the weather and marking the calendar. 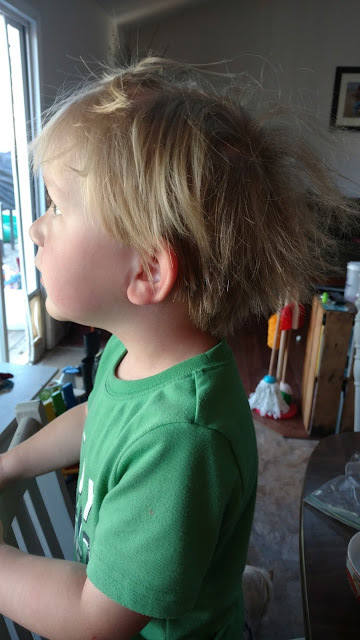 Yesterday, I was especially impressed by his bed head as he looked out the window to study the weather. Today, the weather changed and he was able to put up a cloud and raindrops. As he sat there eating breakfast I asked him what clothes he should wear since it's raining outside today. His brothers couldn't help but chime in and they gave him some of the answers. He said a jacket would be good and shorts and a tank top would be the wrong clothes to wear. He also thought boots would be better than flip flops. Having your child check the weather every morning is a fun first introduction into science, specifically earth science, and how it affects them, even as a little one. Yesterday I had introduced Adam to Bug Bingo and he wanted to start today with that. He got out all the bingo cards and picked the first bug card off of the stack. "I've got that one", he would exclaim and then cover it up with a bingo chip. I have found that going for the three in a row Bingo concept is a bit hard for little ones, so we always go until we get to black out. We made these teriyaki cereal snacks together and he was adding a little bit of extra salt for fun. As he and Peter were playing Bug Bingo I set up the Invitation to Create at the counter. We just recently put up subway tile back splash in our kitchen. I saved a few of the cut tiles to use for our paints. They have no lip on them, so that would be the down side, but otherwise they have been working well. I asked Adam the questions on the Invitation to Create guide card. What do you think the bee is doing? How will you use the bubble wrap? What can you use the pipe cleaner for? When I asked him about the bee and what he was doing he turned it around on me and asked me the question. I explained to him that the bee was collecting nectar for food. I then showed him one way he could use the bubble wrap but with out actually doing it for him, just explaining it to him. He tried it a few times and then asked for a "painting thing" - a paint brush. Peter also wanted to join in and he also wanted a brush. I gave them each a brush and let them do as they pleased with the materials. That's exactly what the invitation concept is all about. An invitation to explore. With the supplies Mother Goose Time offers, it turns a standard art project into more of a STEM project. Lachlan soon joined in and turned the egg carton pieces and the bubble wrap pouch into an egg holding contraption. Adam asked for red paint. I think he was inspired more by the materials than he was by the inspiration photo of the bee. All three of them were really. But I have gotten to know a few of the Mother Goose Time team members, and I am positive they won't be offended. This is what it's all about. Mom, I am done, come wash my brush. As they were working I was reading them the book we got in our box this month called "There Are Bugs!" by Chris Lensch. Peter painted the egg carton pieces yellow and his hands and some of his face. This is the last two pages of the "These Are Bugs!" book. Super cool collection of critters. Our energy was winding down, so the last thing left is the investigation station. I put it on the counter at the top of the tower. I haven't done this in a while. The wooden structure you see in the picture there is called a Learning Tower and it brings a child up to counter height and gives them a safe space for them to stand. We have a roomy kitchen, so it's a great option for us. The boys have spent a lot of time here working with us in the kitchen or on school projects where they can really spread out. Adam's last activity is simply pompoms, an ice cube tray and tweezers. He is then supposed to build blocks around the tray to protect the pompoms. I hope to introduce this to him after he wakes up from his nap. As far as the drawer system goes, I am just not sure yet. It hasn't been as amazing as I had pictured it to be. The con is that it kind of keeps everything tucked away and out of sight. It does however keep it organized and it makes it even quicker for me to grab one of the activities and get started. I had hoped it would excite my super independent 3 year old to have his very own school he could grab and do on his own. He loves to do everything his big brothers do and of course he can do everything "all by myself". He did not, however, get as excited about it as I had hoped. On the other hand, the sunshine has been very appealing. I still have hope because I believe as he gets more familiar with it, he will open the drawers each day to see what surprises are waiting for him. The one drawer he is very familiar with and excited about is the weather drawer and I could not be happier. It's such a great way to get preschoolers to observe the world around them, to get curious and ask lots of questions.